Madness is a complex and contested term. Through time and across cultures it has acquired many formulations: for some madness is synonymous with unreason and violence, for others with creativity and subversion, elsewhere it is associated with spirits and spirituality. Among the different formulations, there is one in particular that has taken hold so deeply and systematically that it has become the default view in many communities around the world: the idea that madness is a disorder of the mind. Contemporary developments in mental health activism pose a radical challenge to psychiatric and societal understandings of madness. Mad Pride and mad-positive activism reject the language of mental 'illness' and 'disorder', reclaim the term 'mad', and reverse its negative connotations. Activists seek cultural change in the way madness is viewed, and demand recognition of madness as grounds for identity. But can madness constitute such grounds? Is it possible to reconcile delusions, passivity phenomena, and the discontinuity of self often seen in mental health conditions with the requirements for identity formation presupposed by the theory of recognition? How should society respond? Guided by these questions, this book is the first comprehensive philosophical examination of the claims and demands of Mad activism. 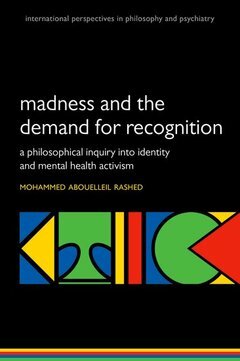 Locating itself in the philosophy of psychiatry, Mad studies, and activist literatures, the book develops a rich theoretical framework for understanding, justifying, and responding to Mad activism's demand for recognition. Mohammed Abouelleil Rashed is Wellcome Trust ISSF Research Fellow at the Department of Philosophy, Birkbeck College, University of London, and Visiting Lecturer at the Department of Philosophy, King's College London. Before moving on to full-time research in 2007, Mohammed studied medicine at Cairo University Medical School and trained in psychiatry in London on the Guy's, King's College, and St. Thomas' Hospitals training scheme. He is the author of several papers and chapters in philosophy and psychiatry on the concept of mental disorder, the concept of culture, the nature of the diagnostic process, madness and disability, empathy and understanding in mental health, and psychiatric ethics.